Summary: This Wristband is a low budget, no frills activity tracker, which tracks both number of steps and calories burned, while being easy to connect to all of the most popular mobile devices. The Elegiant 15 is a great option for those of us who do not need the huge list of features (and associated cost!) that the big-name watches and tackers come with. This tracker was already great value, and now comes with a big discount over at amazon.co.uk, check out the product page for yourself now! The Elegiant 4.0 Sport Wristband is an activity tracker which counts your daily steps, measures the amount of calories burned, reminds you when you’ve not been active and also manages your sleep. Made of stretchy silicon material, the wristband is high on comfort while easy on the eye too, coming in black, red and blue colours. This low cost piece of fitness equipment connects to all of the most popular mobile devices, where you can download the data via USB or Bluetooth. This wristband has touch screen operation, simply slide left or right to switch the functions. The items doubles as a USB stick, connecting it directly to your device to both charge the wristband or download the data, while the Bluetooth 4.0 functionality allows it to talk to your devices too, which include iPhone 4s and Android 4.3 and above. In comparison to other sports activity tackers, this is an extremely reasonable item in terms of cost. Yes, the wristband may not have the same level of functionality as higher cost items, but as a straightforward activity tracker, this certainly fits the bill. The added SMS, call reminder and incoming calls alerts are certainly a welcome added bonus, while you’ll also have ‘find your phone’ functionality. Reviews of the Elegiant wristband are mostly positive, with more than half of the reviewers awarding it the maximum five stars. Many customers are delighted with the value for money aspect of the wristband, while also praising the accuracy of the pedometer. A small number of users have criticized the sleep tracking function and that the instructions for the device are not entirely clear. 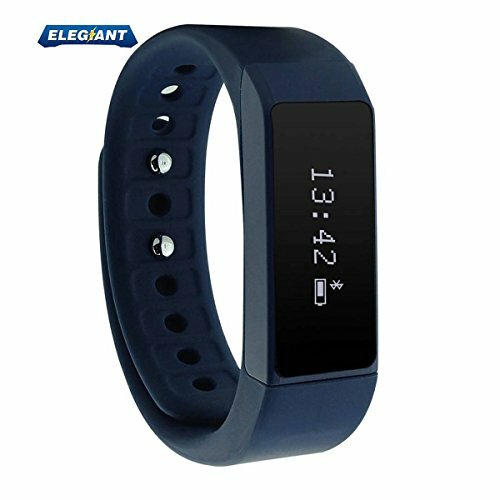 This Elegiant product is a low cost activity tracker that will accurately measure your daily steps and calorie burn. The wristband has a modern, sleek design and comes in three different colours, while connecting to a large number of devices quickly and easily, enabling you to monitor your progress.